Here at Riverbend we feel that in order to succeed as exceptional breeders of the Australian Labradoodle, and to properly develop the Australian Labradoodle breed, it requires us to have a number of dogs in our breeding program. It is our goal to successfully further and develop our lines while having our breeding dogs live in a family environment. We have found that the Guardian Home Program is the best way to accomplish this. This is a very unique program that allows our breeding dogs to live as much loved family members with our locally selected families while participating in our breeding program. This is our way of ensuring that our breeding dogs live with their families in forever homes and still participate in the future development of the breed under our watchful eye. We can’t thank our families enough for the important role they play in the future of the Australian Labradoodle. A security deposit of approximately 50% of the current pet price will be required ($1000 security deposit). Rather than paying full price for a pet puppy, you will receive a “pick of the litter puppy” for a 50% security deposit of the normal pet price. You are getting the best that Riverbend Labradoodles has to offer in an Australian Labradoodle puppy. This means that in the litter this puppy possesses the best qualities as outlined in our breed standard, not only for type, conformation, color and movement, but also for temperment, soundness and coat quality. 50% of your security deposit is set aside for any family who, while the dog is in the breeding program, obtains an Obedience or Agility Competition Title, or completes and gains a Therapy Dog Certification. We recognize the time and work our families invest to gain any of these titles or certifications, and therefore we would like to recognize their accomplishment with the return of 50% of their security deposit. The program is only available to families and individuals who live within a 60 mile radius of Riverbend Labradoodles. We ask that you assess your lifestyle, reliable transportation and permanency in the area to ensure that you are able to meet the requirements of caring for a pet, but also meeting the requirements of the Guardian Home Program agreement. We do require the dogs to come back to us for short visits so they can participate in the assessment and testing process, and eventually the breeding program, but always the Guardian Home dogs return to their family after these short breaks. After your dog has fulfilled the requirements under the Guardian Home Program, we then pay to spay/neuter them for you, and they continue to live with your family in their forever home. You must have a safe and secure environment for a Guardian Home dog to ensure their safety and health. While we prefer families with previous dog ownership experience, we are happy to work closely with families and individuals who are new to dog ownership. A fenced yard will be required, so your Guardian Home dog can remain secure, but also to keep strange dogs out of your yard. Our Guardian Home Program dogs are to be kept as house pets and family members. Even though you are only paying 50% of the normal pet price, we require that you take top notch care of them. This means, but is not limited to, a high quality diet, routine veterinary care, puppy and obedience training, love, exercise, and attention. These are our babies that we place with you, and we want to be assured that they will become your cherished family member. If another dog is a member of your household, it needs to be spayed/neutered. All of our Guardian Home Program dogs, while in the program, are offered free basic grooming, with sufficient notice. All of our Guardian Home Families have the first right to purchase a spayed/neutered pet puppy, with notice, or have first right, if a puppy is being assessed as breeding quality, to take on that puppy as a second Guardian Home Program dog. Health Benefits: If assessed for addition to our breeding program, your puppy will be completely heath tested, without having to pay for any of the testing yourself. We assess puppies around 12 months of age for quality based on our high breeding standards, and then we will pay to completely health test this puppy for things like hips, elbows, eyes, prcdPRA, vWD, cardio, patella, and DNA profiling. Based on those results, we then decide if we will breed this puppy or pay to spay/neuter them for you. If we breed them, they will continue to live with you as your beloved pet while not here having/making babies. If we spay/neuter them, you have a beautiful puppy for ½ of what you would normally pay for a pet. Cost Savings: You can get a top quality Australian Labradoodle puppy for a fraction of the going pet price, or even at a refund of a portion of your security deposit by gaining obedience/agility titles or service/therapy dog certifications. Riverbend Labradoodles selects and places our “pick of the litter” puppies in our Guardian Home Program and this allows our families an opportunity to have some of the best Australian Labradoodles in the world as their family pet. 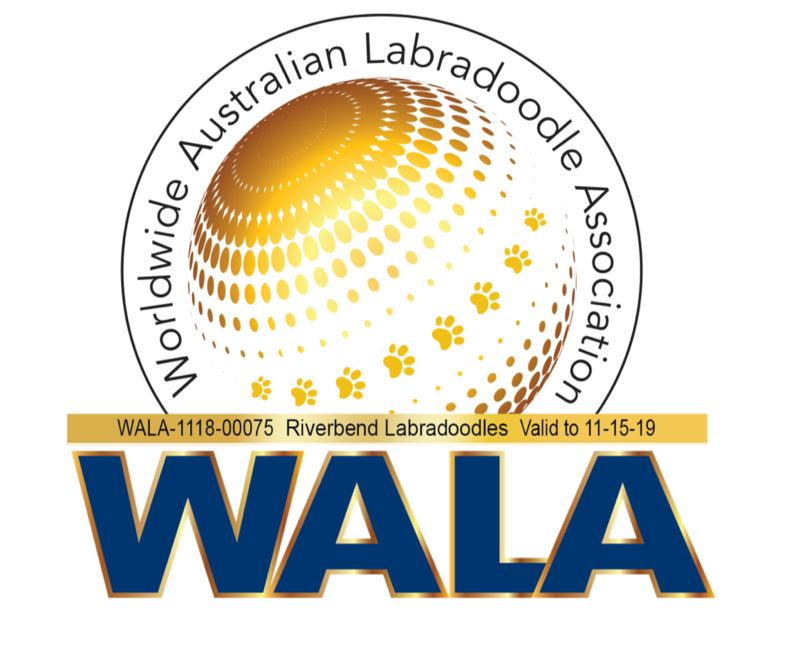 You become part of the Riverbend Labradoodle Family, and contribute to the future development of the breed worldwide, and where the Australian Labradoodle is ensured for generations to enjoy. You get to enjoy being a part of our breeding program and take part in your dog’s puppies going to families or other breeders across this country or even around the World. First 12-14 Months: In adopting a puppy or young adolescent from the Guardian Home Program, the first months are fairly basic. You will pick your puppy up from us and the puppy will live with you as your family pet. Love, training and socialization are the most important things you can do for your puppy at this stage. We expect the girls to have their first season/heat cycle between 9-14 months of age. Upon the start of their season, you need to contact us immediately. If you do not have a safe, protected place to keep them, or do not want to go through this cycle with them, you can bring them to us, and we will take care of them during this cycle to ensure they are not accidentally bred. A season will typically last about 3 weeks. We do not breed our girls under the age of 12 months, or before health testing has been completed. You can expect their next season in 4-8 months. Sometime between 10-14 months of age, we will request that this dog come and have a photo session with us. We try to coincide this photo session around an already planned visit, either for grooming or a health testing visit. By 14 months of age, we will have a breeding program assessment and health testing visit scheduled. We will pay for the full range of health testing to be completed. Once we receive the results from the health testing, we will make a final assessment of adding this dog to our breeding program. 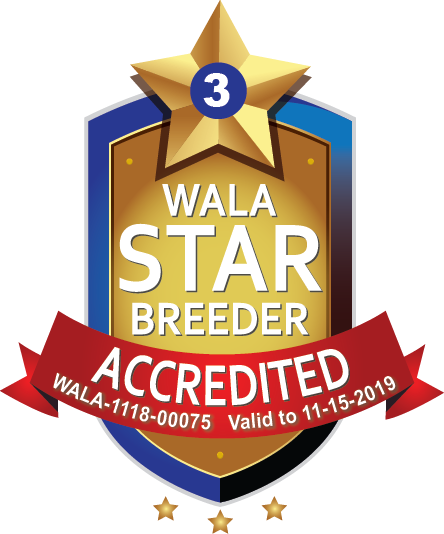 This is our way of being able to keep the best males and females from each litter, and then to have the ability and availability to select the best candidates to continue with the breed’s development. If we decide not to breed this dog, we will then have them spayed/neutered for you, at our expense, and the contract is complete. If we add this dog to our breeding program, we will require you to bring this dog to us at the start of each season that we plan to breed. Or, with a boy, we will contact you prior to needing them brought back for mating (usually 1-2 weeks is needed for this visit). We have found that our boys will get more use in the first year, and substantially less after that. With our girls, during the off seasons (if we decide not to breed during a season/heat) you may keep and house her with you if you have a safe area to keep her protected, or you may bring her to us to ensure an unwanted breeding does not take place. We do not necessarily breed our dogs on every season, and each dog will be evaluated on a case by case basis. After each season they spend with us, the dog will return to you. If we have mated them while here, they will go back home with you during their gestation, and we will give you details as to their care, and when they need to return to us to have their litter. We require that all pregnant Guardian Home dogs return to us one week prior to their due date. This ensures them time to settle in and start nesting in preparation for the birth of their puppies. Once the puppies are born and Mom is settled in, her Guardian family is welcome to schedule visits with her and the new babies as often as they wish while she is with us. Once the puppies are weaned, sometime between 6-7 weeks of age, the Guardian Program dog is then ready to go back home with her family. By this time, Mom is usually more than ready to have puppies with their sharp little teeth weaned, and to go back home to her family. We require between 2-4 litters from our Guardian Home Program dogs once they are in our breeding program. Each dog will be individually assessed with each breeding and litter produced. Riverbend Labradoodles takes the health and well-being of each and every one of our breeding dogs very seriously. It is our top priority to ensure they are in optimum condition for each litter they produce. If we have accomplished our goals in breed development, we may select to early retire them, or we may select to breed them out to the full four litters. It will be solely the decision of Riverbend Labradoodles, and it is our right exclusively to make that decision. Upon retirement, we will spay/neuter them and transfer ownership to their Guardian family where they can be your pet with no further requirements. Any medical costs related to the breeding, and any stud fee costs required to produce the litter are the sole responsibility of Riverbend Labradoodles. Our Guardian Program families are only responsible for routine maintenance and medical care, such as, but not limited to, feeding, vaccinations, flea, tick and heartworm preventative, just as they would if they had a spayed/neutered family pet. Riverbend Labradoodles places males and females, puppies and adolescents in our Guardian Home Program. Occasionally we have adults, but more often they are 12+ week old puppies to adolescent aged puppies that are available. We have all three sizes, Mini, Medium, and Standard that are placed in our program, and you will find that we may have a rainbow of colors in our available puppies. Obviously for us, color is of less importance than the temperament, type, health, and coat of our breeding dogs, so for this reason Riverbend Labradoodles has a policy of listing what puppies we have selected for our Guardian Home Program, and then we help our families choose from our selected puppies to find a match that fits them.